Cambridge Audio Yoyo (M) review | What Hi-Fi? Here’s your dilemma: you want stereo speakers that are wireless, easy to use, portable, look good in your home, will charge your smartphone, and they must sound better than your average Bluetooth speaker. Does such a product even exist? It does now, in the form of the Cambridge Yoyo (M) wireless stereo speakers. They promise something unique: a stereo pair of portable, wireless speakers that combine lifestyle aesthetics and convenience with hi-fi-grade audio. Cambridge Audio has nearly 50 years’ of expertise in producing high quality hi-fi products, many of which have picked up What Hi-Fi? Awards over the years, so if anyone can do it, it’ll be this celebrated British audio company. We’re immediately taken by the Yoyo (M)s at first glance. The petite, stylish speakers are covered in “acoustically transparent” fabric made by Yorkshire weavers Martin Mills. What’s special about this ‘worsted’ wool (with all fibres running in the same direction) is that it’s treated to resist water, dirt and shrinking. That doesn’t mean you can take it scuba diving or to Glastonbury; but it should survive your kitchen and garden just fine. Also, they look nice and feel well-built. Along with the blue finish of our review sample, you can get the speakers in light and dark grey fabrics. Cambridge has paid attention to the inner workings of the Yoyo (M)s, too. Inside each speaker you’ll find a 30mm full-range driver and a 75mm bass driver, both powered by a class D amplifier. Of course the real draw of these stereo speakers is that they’re completely wireless and portable. That’s an unusual set of features for any desktop speakers. Rivals such as the Ruark MR1s (£300) and the KEF Eggs (£350), not only need to be plugged into the mains at all times, but they also have a wire connecting the two speakers. The Yoyo (M)s connect to each other wirelessly and automatically from the second they’re powered on. How do they know they’re in left and right stereo orientations? Easy: the master unit (the one with the logo badge on it) is the right channel (so make sure you place this speaker on your right), leaving the slave unit to handle the left channel. On the portable front, the speakers boast an impressive 24 hours of battery life. This inevitably goes down if you’re listening at raucous volume level, but it gives you leeway to untether both speakers from the mains for long periods of time. Press the button under each speaker to check how much battery is left, and the white LEDs light up accordingly. Each speaker also has a USB port hidden in its base, giving you double the chance to charge up your smartphone when it runs out of juice. Features such as the lack of wires, long battery life and portability make the Yoyo (M) incredibly flexible. We’re not sure we’d use stereo speakers in the same way we’d use a standard wireless speaker, though – it’s much trickier to carry around two speakers than a single unit. You can take just the master unit away and use it as a single speaker, but Cambridge’s insistence of using the Yoyo (M)s as a stereo pair is at odds with this. Cambridge keeps things simple with standard Bluetooth streaming, and 3.5mm auxiliary inputs (one in each speaker) for hardwiring music players. In comparison, the KEF Eggs offer Bluetooth aptX (which offers better quality streams) and even 24-bit/96kHz hi-res music over a USB input. But the Cambridge’s simplicity means it’s easy to use. There’s no remote, as you’ll be using your smartphone’s controls to skip tracks and adjust volume. You can also tap any of the touch-sensitive buttons on the units’ rubberised top panels to control the speakers. The icons light up when you poke at them. All the controls – volume, playback, Bluetooth pairing – sync simultaneously across both speakers, too. Want a third way of controlling the Yoyo (M)s? Okay then: simply wave your hand over the speakers as a magician might. Left to right plays and skips tracks, while going the opposite way pauses the music. It’s a nice idea, but gesture controls are seldom intuitive and a bit hit-and-miss when you don’t get the speed and movement just right with the Yoyos. Once we stop playing around with the Yoyo (M)s’ many features and start streaming music, we’re entertained by Cambridge’s presentation. The sound from the compact speakers is impressively large-scaled and infused with warmth. Conor Oberst’s vocals in Counting Sheep come through prominently; it’s perhaps a touch forward, but it sounds solid and detailed. It’s a comfortable listen. Guitar strings and basslines have plenty of weight behind each strum. The sound is pretty powerful and meaty, too, and the authoritative way in which the speakers go loud and spread music across the room is definitely appealing. You do sacrifice a modicum of fine detail and accuracy in favour of that rich presentation, though. We’d like more clarity, too, as there’s a thickness to the sound that we wish we would scrub away. In comparison, the KEF Eggs offer a more refined sound that combines clarity and precision to deliver a subtler and more dynamic sound. And they’re only £50 more than the Yoyos. Alt-J’s Breezeblocks sounds fluid and sprightly through the KEFs; the tune is less agile through the Cambridge speakers, weighed down by the rich coating covering the sound. The treble is also rolled off a touch, squashing the dynamics of a song, and the rough edges are smoothed off as well. As a result, you don’t hear the vocal nuances or the crunchy effects in Portishead’s atmospheric Biscuit with the Cambridge. Conor Oberst’s earnest, wavering singing sounds more delicate and expressive through the KEFs, too. We think Cambridge has played it a touch safe with the Yoyo (M)s in trying to tick all the boxes. We were hoping for a sound that was more articulate and dynamically challenging – something closer to the kind of performance we get from the company’s Award-winning CX series – along with the lovely design touches. But there’s plenty to like about the Yoyo (M)s’ big-scaled and smooth presentation, as it works well with all kinds of genres. You can leave the speakers playing for hours on end and have a perfectly enjoyable time. Their flexibility and extensive features go a long way, too. 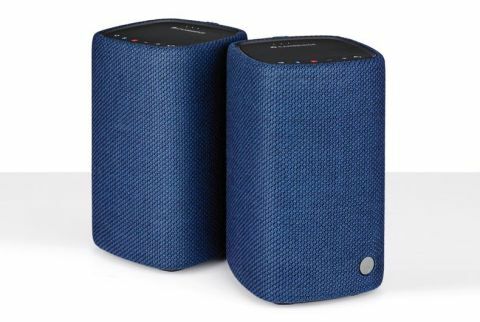 The refined KEF Eggs are still our go-to desktop wireless speakers at this price, but the Cambridge Yoyo (M)s are a charming pair of stylish wireless speakers that are worth a place in your home.